KENNY SHIELS proved he’s prepared to be ruthless in his attempts to guide Derry City to Europa League qualification for the second successive season. The Derry City boss demanded a response after the demoralising hammering by Bray Wanderers which had questioned his side’s pride. Too many players just didn’t show up and after much scrutiny, analysis, team meetings and finger pointing, the Candy Stripes were shaken out of any complacency in their quest to clinch third spot. Every decision I make is for the benefit of the team. If that means taking out players then that will happen without a doubt. Motivation may go a long way but the team needed to dig deep and produced a compact, team performance to see off a stubborn Drogheda side who were hoping for a stay of execution. After getting off to the perfect start with a composed finish from Conor McDermott - his first official senior strike - and a poacher’s goal from Ronan Curtis with just 14 minutes on the clock, the attendance were expecting a repeat of the one-sided 4-0 victory in the corresponding fixture last April. A combination of missed chances, the wind and a resilient Drogheda side, ensured there was no goal fest but it was much more comfortable than the scoreline suggests. Much was made about City’s leaky defence going into the game, having conceded 15 goals in their previous four matches and despite the late Mark Doyle consolation strike, it was solid defensive showing from the Candy Stripes who opted for three at the back. Shiels went with an attacking formation, making three changes with Dean Jarvis and Darren Cole restored to the starting line-up at the expense of Eoin Toal and Jamie McIntrye while Harry Monaghan got the nod ahead of Aaron McEneff. 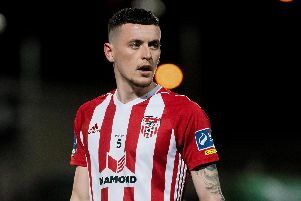 Explaining his team selection when it was suggested to him the omission of the club’s joint top scorer Aaron McEneff may have raised a few eyebrows pre-match, Shiels said ‘something had to change’, insisting he’s prepared to make the hard calls for the benefit of the team. “Up until a month ago he’s (McEneff) been brilliant,” said Shiels. “But any player that doesn’t start the game, it will be because they’ve taken a dip and we need to get a reaction and a response. I’m really hopefully Aaron will have the strength of character to take the disappointment and come back and be better. “But I don’t think it was a shock to anybody that we needed more depth in the midfield when people like Robbie Benson is running off us to score two goals and Gary McCabe and Aaron Greene are running off the bottom of midfield. Something has to change. “Every decision I make is for the benefit of the team. If that means taking out players then that will happen without a doubt,” he stressed. McEneff’s replacement helped shore up the City midfield while the return of Jarvis and Cole added much needed experience to the backline. It was a pivotal game for City and a hugely valuable victory which closed the gap on Shamrock Rovers to a single point. Following Limerick’s elimination from the FAI Cup at the semi-final stage at the hands of Cork, fourth place is now expected to be good enough to secure a Europa League spot. The only scenario where fourth wouldn’t be enough is if Rovers won the cup and dropped to fifth in the league standings. So after a week of soul-searching and head scratching, things suddenly look a lot brighter for Shiels and his troops after a first win in three league matches and the Derry boss felt there was an over reaction to recent results given they remain on course for Europe. “We’re one point off third and it’s remarkable how people are here,” said Shiels. “The supporters come out and we will give them everything we have to win a game of football. That’s what we’ve done. We’ve played 29 games and we’ve lost seven of those so I’m delighted with the way the boys have responded to get a result.